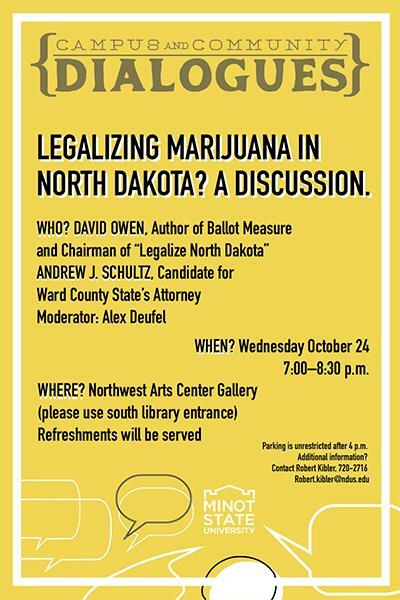 MINOT, N.D. – Minot State University’s Humanities Department will be hosting a Campus and Community Dialogue to discuss legalizing marijuana in North Dakota on Oct. 24 from 7-8:30 p.m. The panel will consist of David Owen, who is the author of Measure 3, and Minot attorney Andrew J. Schultz, candidate for Ward County State’s Attorney. Alexandra Deufel, professor of biology at Minot State, will moderate the discussion. The event is free of charge and will take place at the Northwest Arts Center located on the lower level of the Gordon B. Olson Library at Minot State. The entrance is on the south side of the library. Refreshments will be provided. Those unable to attend can livestream the event on the Minot State’s Facebook page. For more information, contact Robert Kibler at 701-720-2716 or Robert.Kibler@minotstateu.edu.